Since the deer moved into many of our landscapes it can be difficult to have a beautiful garden that will not be devoured in the middle of the night. Barring a blind taste test by an unknowing fawn, I have found the following great perennials to be deer resistant. ‘Everillo’ is a bright and exciting new grass for shade with striking gold foliage. 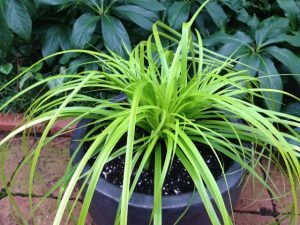 This evergreen sedge is a sport from the popular ‘Evergold’. 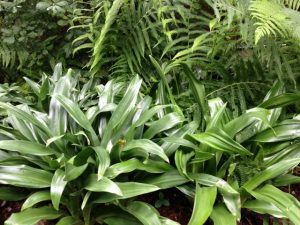 The 1 foot tall by 2 foot wide plant is great as a single accent or in mass. 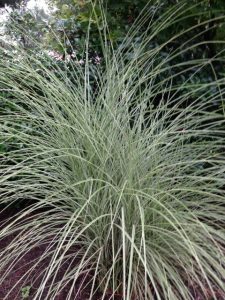 In the shade garden ‘Everillo’ is a fantastic year round grass that will grow on you. Try it in a container for great color. ‘Snow Fairy’ bluebeard will brighten your border with bold variegation that lasts all season. 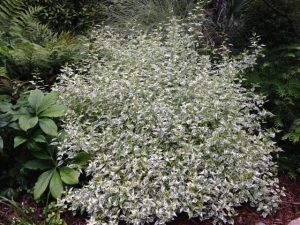 This mounding perennial reaching 4 foot tall and wide combines attractive green and white foliage with dainty blue flowers in late summer. I value ‘Snow Fairy’ in the garden because it provides a reliable bold accent in sun to part sun. The shrub-like form looks great from mid-spring until the first frost. Japanese sacred lily is one of the best evergreen perennials for dry shade. The wide dark green foliage stands out and offers a nice contrast with most textures and colors. In addition, bright red berry clusters form in summer at the base of mature plants. Rohdea japonica also is perfect in containers, especially the ones you forget to water. This maiden grass continues to be my favorite ornamental grass for the mixed border or massing. The narrow variegated blades stand upright in a graceful vase shaped form. By late summer the plant is topped with decorative plumes that last for months. This is the last grass we cut back in early spring due to the great form it offers through the winter. In sun or part shade this is the grass that always looks great and never flops. ‘San Carlos Festival’ is truly the perennial that blooms all season. 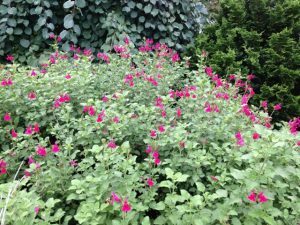 This long-lived and easy to grow sage combines great foliage with lots of deep pink blooms from late spring until winter arrives. Our six-year-old plant is 4 foot wide and 3 foot tall. This outstanding salvia offers great form and intense color in any full sun garden. Try combining ‘San Carlos Festival’ with Abelia ‘Rose Creek’ and Juniperus conferta ‘All Gold’ in the mixed border. 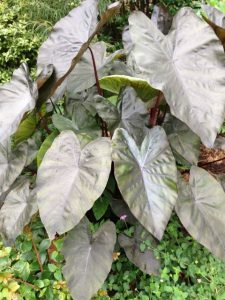 This elephant ear has become one of our favorite tropical perennials because it consistently over winters, returning early with robust new growth. 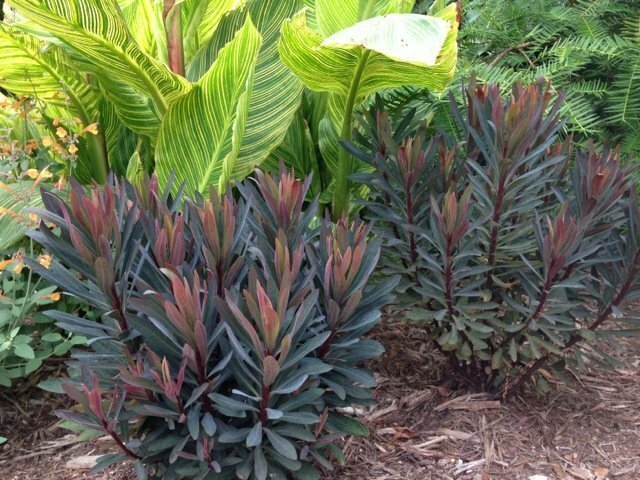 It is a tight clumping elephant ear with glossy dark purple foliage that truly asks for attention. The 4 foot tall plant is a perfect accent for any sun to part sun bed. If you don’t have a spot in the garden, ‘Black Coral’ is perfect in a large container. ‘Honeybee’ calamint is the perfect tidy small perennial for any sunny garden. 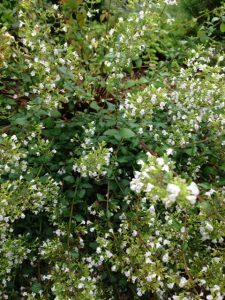 This great plant begins blooming in mid summer with a profusion of small white flowers and continues into fall. 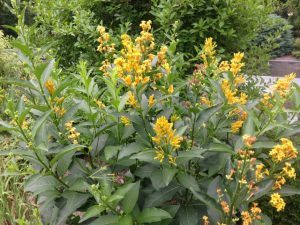 As its name suggests, the plant is covered with bees making a great addition to any pollinator garden. ‘Honeybee’ reaches 2 foot tall and wide and never needs to be cutback during the growing season. ‘Tango’ hummingbird mint is another terrific selection with orange flowers that blooms all summer in our garden. 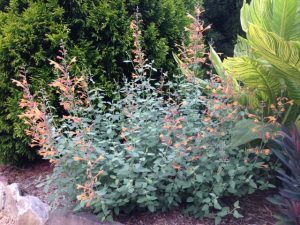 The spicy blue green foliage is topped with 18-inch tall bright orange flowers from late spring until fall. This new agastache selection attracts hummingbirds and lots of fun pollinators. Consider ‘Tango’ for any full sun bed that has good drainage. Blackbird spurge is a fabulous spurge with dark purple foliage that receives attention in our tropical garden throughout the year. This 18-inch tall evergreen perennial provides intense color combined with interesting blooms in early spring. Blackbird grows well in any full to part sun garden with good drainage. Try it in a container where you need a dark evergreen accent.